Any destination can become a budget destination with the right travel tips. But, it is far easier to pick your travel with budgeting in mind. Costa Rica’s motto is Pura Vida meaning simple or pure life. More than just a saying, it is a way of life in Costa Rica. It is hard to not love Costa Rica since it really has something for everyone. Adventure travelers can try an endless list of activities like zip lining, ATVing, and horseback riding. If you are outdoorsy, both hiking and waterfall chasing are very popular activities. Into animals? Wildlife watching is easy with the abundance of birds, whales, insects, monkeys, and sloths that roam the country. Uvita: Less crowded than adjacent Dominical, Uvita is full of gorgeous beaches and waterfalls. Arenal: Named for the massive Volcano that towers over the city, don’t miss hiking the lava rocks. Monteverde: Known as the cloud forest, the elevation in Monteverde produces a unique environment which plays host to a wide variety of plants and animals. So many of your friends are posting about Thailand simply because it is amazing. Cheap, beautiful, and full of culture you really can’t go wrong in any region. Cheap flights are easy to find to Bangkok International Airport (officially named Suvarnabhumi Airport) from almost anywhere. Once in Thailand flights to different regions are cheap – as is everything else. Chiang Mai: Located in north Thailand, known for jungles and elephants. PS… please don’t ride elephants. Instead, visit a sanctuary. Bangkok: Chaotic streets, insane nightlife, and extremely cheap. Think of it as New York City on steroids. The Islands: Anywhere is beautiful so don’t overthink it. Ko Phi Phi is the most popular (and most crowded and most expensive). Phuket is a party island while Krabi is a bit calmer. A diverse landscape with mountains, desserts, and souks to explore, expect chaos everywhere but embrace the unique culture. I promise Morocco is nothing like you have ever seen before. 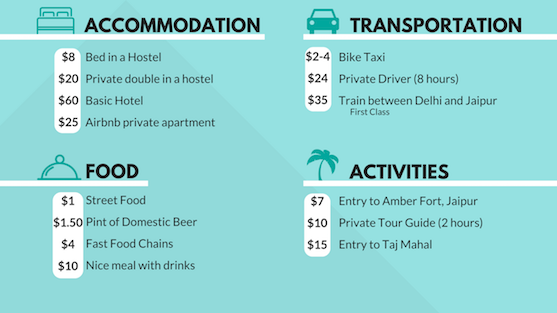 You don’t have to plan ahead, private drivers and tours are extremely cheap once you arrive. Book them through your hotel or hostel (again, not online before!!!) so you make sure you get the best price. Marrakech: The most popular and largest city, Marrakech is a must visit. The famous square, Jemaa el-Fnaa, sees thousands of people a day, eating from food stands, getting henna tattoos, watching live music, magicians, and even witch doctors. Fez: The capital of Morocco till 1912, Fez is a city full of history. Its streets are over 1200 years old and full of an eclectic mix of sights, sounds and even smells. The Sahara: Not technically a city but you should definitely visit while in Morocco. 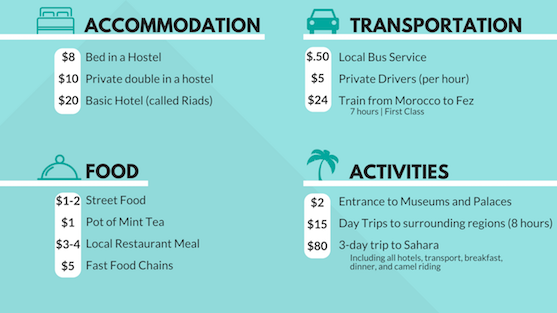 3-day trips from Marrakech or Fez start at around $80, all inclusive, including camel riding. A huge country with a huge population, India is sensory overload in the best way possible. I wasn’t expecting India to be so downright beautiful, it truly surprised me when I traveled there. You can stay at luxurious 5-star hotels for next to nothing or backpack on a shoestring budget. Start with India’s golden triangle: Delhi, Jaipur, and Agra. It is an excellent introduction to the huge country and includes top sights like the red fort in Jaipur and the Taj Mahal in Agra. 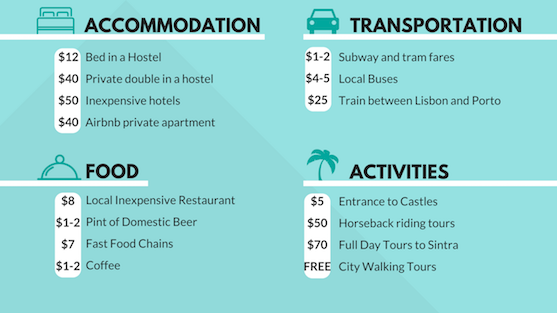 Any country in Europe can be done on a budget but Portugal makes it the easiest. I don’t understand why it is so often overlooked for Spain. Portugal is marvelous in its own right. You can expect beaches, cliffsides, a thriving wine country, cheap and lively nightlife, and the most colorful buildings and castles you will ever see. Porto: Known for its port wine production, Porto is a gorgeous city on the water. Beaches are close by and full day trips to surrounding areas are cheap. Lisbon: The capital and largest city in Portugal, Lisbon is actually one of the oldest cities in the world. It predates Paris, Rome, and London by centuries. In my next article, I am going to share some of my best tips for budgeting when you’re on an inconsistent income. 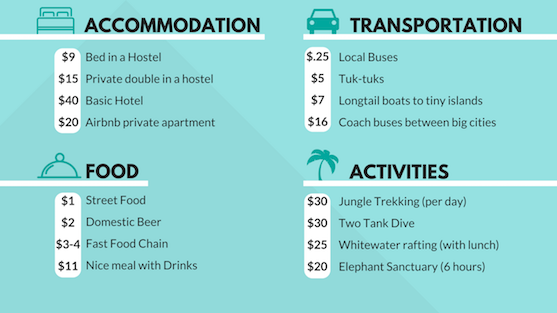 It’s a bit off the travel topic, but something I had to master and I’m excited to share my budgeting system! Be sure to follow on Mint and follow me on Instagram so you don’t miss a single article.